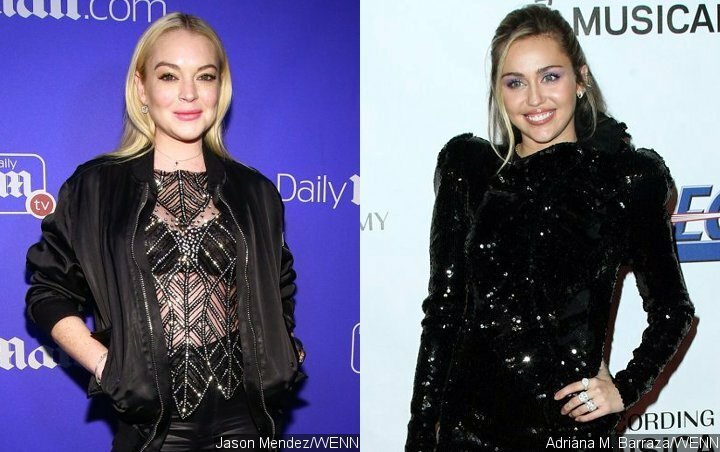 The ‘Lindsay Lohan’s Beach Club’ star appears to feel that what Miley writes in the caption of her sultry pic is relatable, though some people seemingly don’t think so. Lindsay Lohan shows off unprecendented level of confidence in her comment on Miley Cyrus‘ recent Instagram post. The “Freaky Friday” alum left an epic comment in the post which featured a photo of Miley sporting a sultry facial expression. The black-and-white pic saw the “Wrecking Ball” hitmaker looking seductive. “When the doorman asks to see ID…… motherf***er this FACE is my ID,” so Miley wrote in the caption. Seemingly feeling that the caption was relatable for her, Lindsay chimmed in the comment section. “only girls like us know how to pull that [look],” she said, making some people raise their eyebrows. Miley and Lindsay have been friends for so many years, so this is hardly the first time they show support for each other in social media. In January, the wife of Liam Hemsworth covered Lindsay’s 2004 track “Rumors” on her Instagram Stories post. The “Parent Trap” actress appeared to like it as she later reshared the video on her own Instagram Stories. “Love you!! !” she captioned the clip.